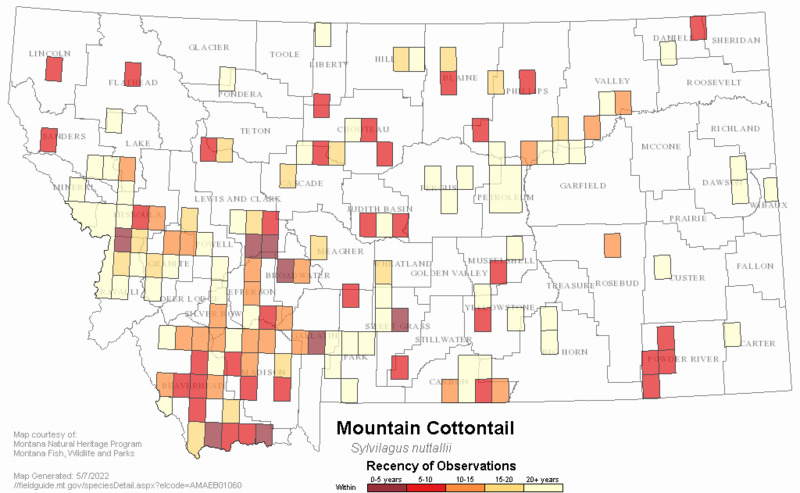 Primarily dense shrubby undergrowth, riparian areas in Central and Eastern MT. In mountains, it uses shrub-filled gullies and forest edges (Hoffmann and Pattie 1968). Sagebrush may be a principle food. Grasses also a preferred food in spring and summer (Chapman 1975). Juniper sometimes used. Western counterpart of the Eastern Cottontail (S. floridanus). Not well described for Montana. Usually feeds in or near cover (Chapman 1975). Breeds in spring and summer. Young reach full maturity within a year. Very high reproductive rate; reports vary: 2 to 4 or 5 litters/year (Chapman 1975). Chapman, J.A. 1975. Sylvilagus nuttallii. Mamm. Species 56:1-3. McKay, D. O. and B. J. Verts. 1978. 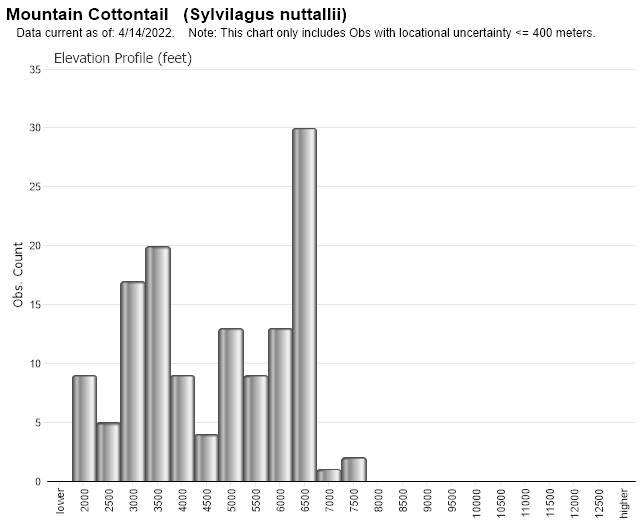 Habitat preferences and distribution of Nuttall's cottontails. Northwest Sci. 52(4):363-368. USDI Fish and Wildlife Service., 1961, A Detailed report on fish and wildlife resources affected by McNamara Dam and Reservoir, Blackfoot River Project, Montana. June 1961. Verts, B.J., S.D. Gehman, and K.J. Hundertmark. 1984. Sylvilagus nuttallii: a semiarboreal lagomorph. J. Mammal. 65:131-135. Williams, O. 1955. 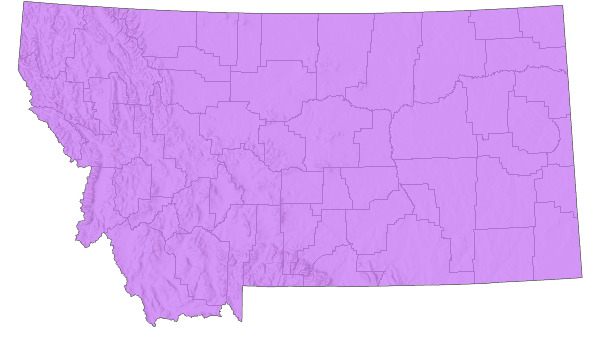 Distribution of mice and shrews in a Colorado montane forest. J. Mammal. 36(2): 221-231. 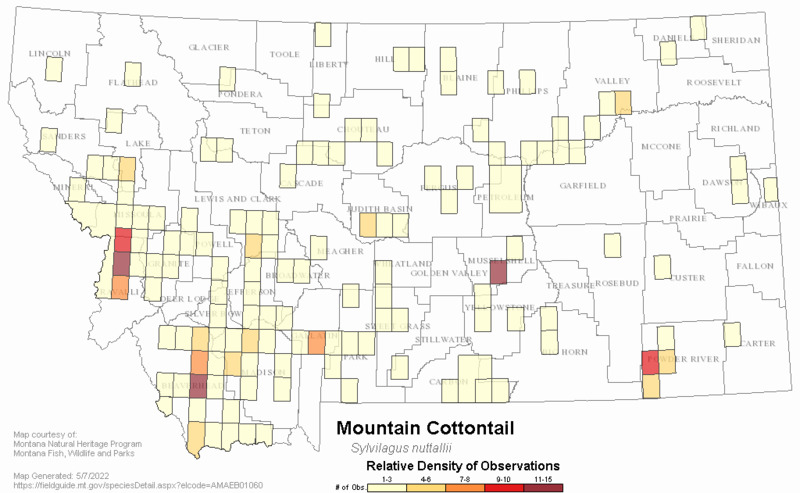 Web Search Engines for Articles on "Mountain Cottontail"